According to a new national survey from Ottawa-based Abacus Data, the Conservative Party continues to hold a nine percentage point lead over the NDP. The Liberal Party has seen a small increase in support while NDP and Conservative Party support is down since December 2011. Nationally, the Conservative Party has the support of 37% of decided voters (down three since December), followed by the NDP at 28% (down three), and the Liberal Party at 21% (up three). The Bloc Quebecois and the Green Party are well back at six percent and seven percent respectively. The Liberal Party is trending up in our latest national poll due largely to a significant increase in support in Ontario. In fact, at 21%, the Liberal Party is at its highest level of support in our tracking since mid-way through the 2011 Federal election and five points higher than their low point in our tracking at 16% at the end of May. Our latest numbers for the NDP continue to trend down. 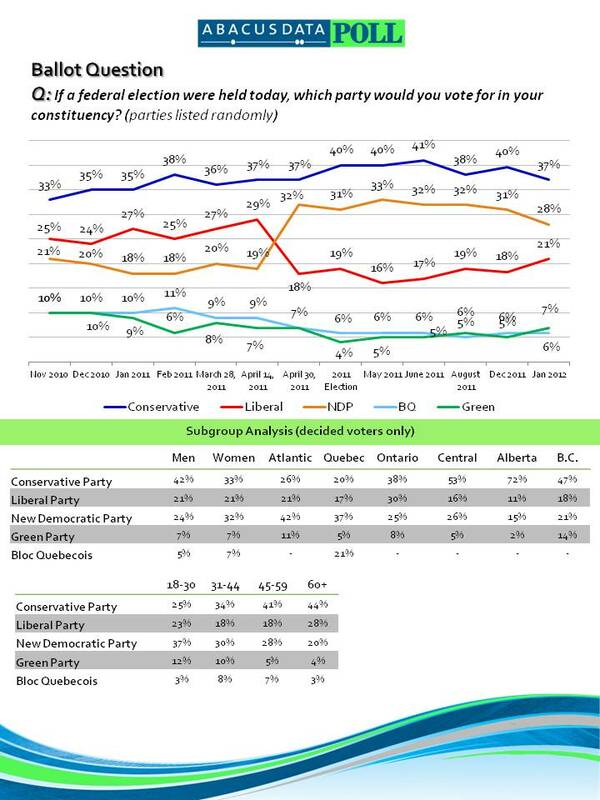 After peaking at 33% in our survey at the end of May, the NDP is down to 28% nationally, the lowest point for the NDP in Abacus tracking since the May election. For the incumbent Conservative Party, the national numbers are down since December but we will have to wait another month to see whether this dip is a longer term trend. Regionally, the Conservatives continue to do well in the Prairies (52%), Alberta (72%), and BC (47%) while the NDP continues to maintain a healthy lead over the three other main parties in Quebec (37%). The Liberal Party is strongest in Ontario at 30% support. 44% of Canadians surveyed believed that things in Canada are heading in the right direction while 39% believed things are headed in the wrong track. This is largely unchanged from December. The federal government’s approval rating did not move at all with 40% of Canadians surveyed either strongly or somewhat approving of the federal government’s job approval while 43% disapproved. The government’s approval rating is highest in Alberta (62% approve) and lowest in Quebec (20% approve). The percentage of Canadian disapproving of the federal govenrment’s management of the Canadian economy is down 10 percentage points from December. Thirty-eight percent (38%) either strongly or somewhat approved while 23% either strongly or somewhat disapproved. The remaining 39% neither approved nor disapproved. The personal impression of the main party leaders remained virtually unchanged since December with the exception of Bob Rae whose favourable numbers continued their trend upwards. The upward trend we have seen in the Liberal Party numbers in other polling is confirmed in our own polling. Although the increases have not been as substantial, the Liberal Party certainly has some positive momentum coming out of their national convention. With a lack of a permanent leader, the appearance of a reenergized Liberal Party, and what appears to be a dull leadership race, the NDP support’s historic level of support is starting to leak to other opposition parties. Although this may be resolved once the leadership race is over at the end of March, the NDP’s leadership vacuum and the resulting inability to stake out clear positions on key debates such as the Northern Gateway pipeline means that it will continue to be overshadowed by Bob Rae and talk of Liberal Party renewal.